Egon Egemann studied classical violin and Jazz at Graz Music Academy in Austria. He settled in Switzerland following studies in Boston (USA) and founded the Egon Family Orchestra. By the end of 1989 he had decided to start a solo career. 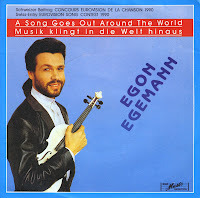 In 1990 Egon was selected to represent Switzerland in the Eurovision Song Contest 1990 with the song 'Musik klingt in die Welt hinaus'. The song finished eleventh out of 22 competitors at the Contest. Egemann returned to Eurovision in 1998, as composer of Switzerland's entry in Birmingham, 'Lass ihn'. Performed by Gunvor it came twenty second (last) with no points.